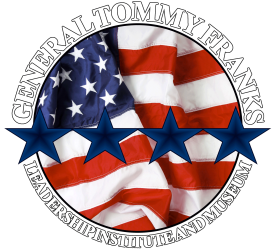 Happy New Year from the General Tommy Franks Leadership Institute and Museum! The Museum is dedicated to telling the story of the United States military and investing in the next generation of leaders through educational outreach programs with a focus on the ideas of leadership, patriotism and service. Through the assistance of our generous donors and supporters, the Museum is able to continue its mission to advance the understanding of historical events, encourage leadership development and inspire enlightened decision making. The GTFLIM has invested in the lives of thousands in the past year alone. Support the Museum and its programs by making a donation now. Take the challenge and invest in the development of leaders when you sign up for a Tour of Duty. The Tour of Duty Challenge is a membership program with a recurring donation pledge. Each Tour of Duty membership level has membership benefits, from free gifts like challenge coins and books to exclusive store discounts and invitations to private Museum events. Your gift of $25 per month will provide programming for 100 students, $50 per month will provide a new educational interactive kiosk, $100 per month will provide for a regional leadership training workshop and $250 per month will provide for the development of a new Museum display. EVERY gift is a significant investment in the lives of others! Find out more on how you can make an impact today.